Anti-war on Syria protests broke out in Washington and Los Angeles cities on Sunday. The demonstrators gathered in front of the White House and chanted slogans condemning the tripartite US-British-French aggression which was launched on Syria Saturday. Another protest was set up in downtown Los Angeles, demanding the US and its allies to refrain from launching further attacks and to not interfere in the Middle East’s affairs. More protests are expected to take place in other American cities, including New York later today. In the same context, the Arab-American Committee for defending Syria and a number of US anti-war organizations rejected and denounced the tripartite aggression, calling for stopping backing terrorism and extremism. 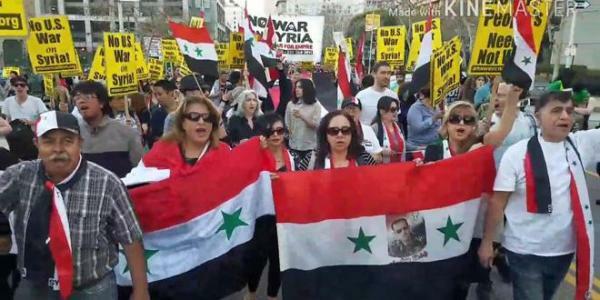 During a protest stand, the protesters called on the US administration to change its policies towards Syria and to stop its repeated aggressions which could ignite conflicts in the world and endanger the international peace and security.